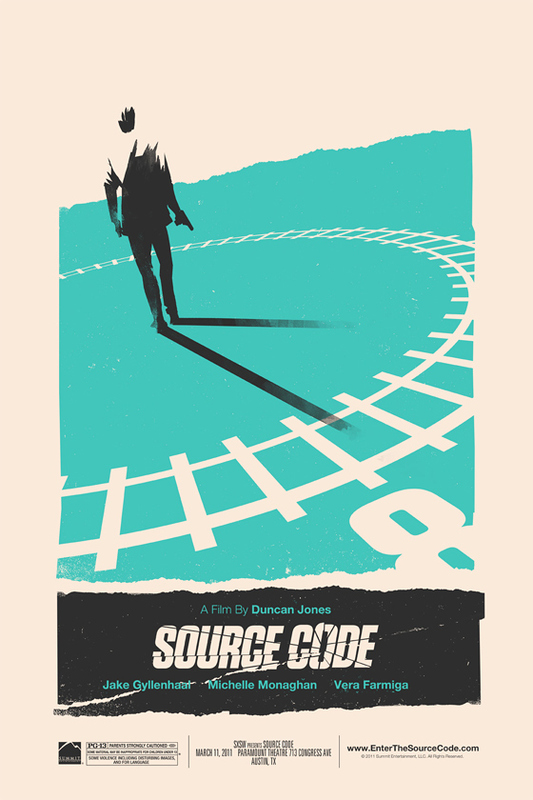 With Moon director Duncan Jones' latest time-travely/sci-fi thriller Source Code finally premiering at SXSW in a week, we're getting pretty damn excited. Empire has debuted a UK poster for the film, which I thought looked pretty damn cool and was worth featuring. But on top of that, I also wanted to point out the awesome poster that Mondo Tees had artist Olly Moss make for their "Director's Series", as well as a Moon poster. The Olly Moss one (seen below the UK quad) was unveiled on IMDb and is available at SXSW. I love the design of it, it's simple and sleek, and means so more once you've seen the movie. Check out both below. Click on either of these posters to be taken back to the original source and to see either in full-size. Enjoy! And here's the official Source Code SXSW poster, designed by Olly Moss. Also check out his Moon poster! Get more info on the Mondo Tees poster from Twitter and watch the Source Code trailer here if you haven't. A sci-fi story centered on a soldier who wakes up in the body of a person who witnesses a train explosion. Source Code is directed by one of our very favorite up-and-coming British filmmakers, Duncan Jones, son of David Bowie whose feature debut was the brilliant sci-fi film Moon. The screenplay was written by TV writer Ben Ripley, making his feature debut, and was featured on the Black List a few years ago. Vendome Pictures and Mark Gordon produced. 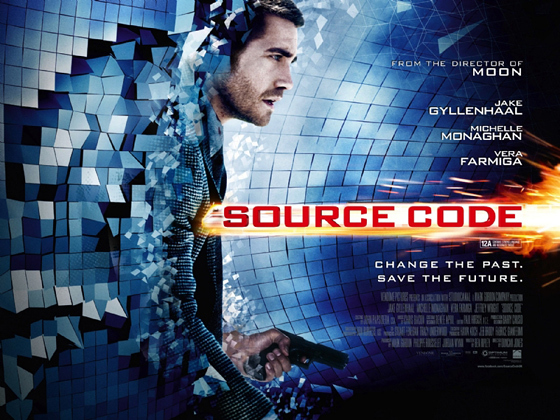 Summit Entertainment is bringing Source Code to theaters everywhere starting April 1st just before the summer kicks off. This is highly suggested viewing, it's a fascinating sci-fi thriller! Correction - one good poster. The first one is pretty average. The second poster is amazing. I would put that on my wall. hmmm...the second one reminds me of oceans 11,12,13 whatever.. I like the second one a lot because it has that "moon" feel to it. Where can I buy that second poster or the moon poster?